Ok so is it unrealistic to expect a 20" VERP .308 (not super) to keep MOA or 2-3 inches in the range of 300 to 400 meters with 168/178 grain ammo? stock probably not, after some mods, maybe. I will say that the MOA posted is a bit agressive. So what about 1 MOA? I know a lot depends on the ability of the shooter. I do plan on getting one here within a couple of weeks. I will be changing out the stock with the fixed buffer tube and CTR, along with using the TWS top cover for a scope I will be making other compliance changes required as well as a trigger job. My goal is to have a very reliable and accurate rifle once these changes are made. I do not want to put my money into this if is not going to accomplish this goal though. it will be reliable and fairly accurate, stock its capable of 1-2 moa, with the buffer tube it should help bring it in a bit. I still question the stability of the TWS rail however. seems fine for tactical sights, not so much for scopes. maybe others will chime in on that with experience. changing the trigger or even just polishing the existing trigger might be a good recommendation as well. with these old eyes and a scope. I know "pics or it did not happen"
Well I dont have any. What do you get on the other day and what is the average of good days? Have made any mods and if so what have you modified to tune it to where you like it? also any recommendation of sight set ups for accuracy are welcome. hitting the steel as many times as I can in under 1 min. I have been 2 AM days and 1 PM day. and in your face in the afternoons. On the "other" days I just miss the plate by a bit(inches). for the lower rail for a bipod(I know Bipods are for pussys). Made a scope rail from stuff I had around the shop. This is where ya will give hell. Scope is a NcStar 6 - 24 x 50 MIL dot. but I did not buy it for yall and it works for me. Here is a pic of my S308 with another scope. When I shoot I try to shoot fast, 10 rounds in under 1 min. hit what ever is going on, I do sight it in "hot"
Damn I aint typed that much in a bit. that is a nice set up. Thanks for your response, It helps with getting some of my ideas put together. I have no gripe with your equipment. I am of the feeling that if it works for that is what matters. So here is a loaded question. This all started with trying to determine my first .308. I have been looking at the AK .308, AR .308 and the SCAR 17, yes the SCAR 17s. I can set up the set up the VEPR/SAIGA .308 20" barrel for a total of right around 1,600, the AR .308 around 1.5K to 2K and the SCAR for right around 2,600. For the money I get more in the VEPR. I am looking for accuracy and reliabilty. The AR is 3rd on the list due to the reliability issues in harsh conditions. The draw back is the twist on the VERP which is about 1:12 and this causes some limitiations in ammo for long range and required the use of lighter grains from what I read. The SCAR is reliable and accurate, just a pure beast, but the price tag is sky high. I really would like either the VEPR or SCAR17 any thoughts and not just buy what you can afford. I would really like the VEPR is the ballistics are there. although a bit more expensive the super is supposed to have a tighter rate of twist, the .223 is 1:9, I would imagine the .308 is either 1:10 or 1:11 which is about ideal for the round depending on load. 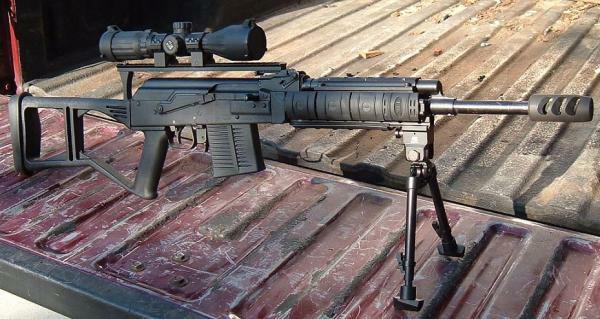 I've been advised against the VEPR already by some people who told me to get a HK91 or a saiga, but the idea of having an RPK receiver that won't die is very appealing still. The FAL is pretty much just as tough as the VEPR from what I can tell and they have pretty much equal and opposite ideas on the gas bolt system what with the FAL deciding to just let enough gas into the system and venting the rest only using all the gas if the ammo is under powered, whereas the AK systems basically always run it all in and always achieve enough gas no matter what the ammo. Both seem equal to me in that regard as well. Furthermore, they both come in a 16-18" barrel the way i want them to be and both have aftermarket sidefolding adjustable stocks. They both weigh roughly the same from all the information I've read and accessories that I would add. Sooooo... I could save about $500-800 on the VEPR altogether versus the FAL and get the best Soviet Bloc gun in history.. or I could be confident that I'm getting the best Western gun in history with the FAL.. it's a tough decision..
both weapons are very reliable, cost wise I think you might make it out better with the vepr unless you want to customize it. the vepr tends to have a softer recoil compared to the fal, and especially compared to the HK91 and its many clones. hk91 however has the most dirt cheap mags on the planet. if you go with the vepr and want extra steel mags go with csspecs if you dont mind minor defects the slab box they sell makes the mags somewhat affordable, I got a box sitting on my desk right now, and I honestly cant find the defects that they had an issue with. Yah, I was already thinking CSSPECS seems like a good guy from his comments on the forum, which would give him preference for who to buy mags from first over TSD. I'd like to see him make some 30-45 rounders.. If he does that or at least gives a promise that he'll be able to keep within a year, I'm sold on a VEPR and he'll get my business in the future (That's Right CSSPECS, I'ma Callin You Out! ) though I'd still buy the TSD side folding stock because well, that looks like a great mod. Furthermore though, if he made some 30-45 round mags (maybe go galil-style and make them 35 rounds or RPK style and 45 rounds), that'd give VEPR users something to thumb their noses at saiga, M-14, FAL, SCAR, HK91, and any of the other .308 battle rifle users.. How'd that be for irony? I mean, RPK receiver, why not RPK levels of ammo running threw them? Also, a surefire style 4-stack type mag would be pretty cool too, i think they beat drums weight wise. Then again, I don't know his R&D budget, could be strapped for cash and not be able to make the higher capacity mags and that'd make me sad, very very sad. the 4 stack from what I have seen seems somewhat complicated construction compared to a drum or galil style mag. for the standard .308 vepr though any of those mags would be awesome. although they would fit the super as well I couldn't see the need for that particular rifle. the 20 is probably plenty for a super. yea the super is my step between I like to be able to take long shots when the need calls for it, but its a rifle built like a tank. I have a lot of time issues right now as far as R&D go. We have a project going not for the .308s that everyone should like..
As for ridiculous capacity magazines..... I'm sure we could build them, even a 40 round mag die would fit on my press. It would stand 11.5 inches tall and likely weigh 3.5 lbs loaded, which is close to an AK-M 40 round if it was less curved.... I should probably get booking on something ridiculous since the zombie Apocalypse is coming up (Election year). I've been advised against the VEPR already by some people who told me to get a HK91 or a saiga, but the idea of having an RPK receiver that won't die is very appealing still. What were the reasons for the advise given to not pick up a VEPR? I leaning towards the VEPR but before I do just want to know what I would be getting myself into. That is about what I calculated. $1400 and maybe a tad more with extra mags. I want something rugged in .308 and while the VEPR will not be as accurate as the SCAR, LWRC, or even a Rock River operator I believe that it will be accurate enough and very tough and be worth the money instead of having to spend upwards of $2060 or more. Accuracy really isn't the issue with the VEPR, especially since you're going for the 20" barrel. There's a pic or two floating around on the website of Saiga's achieving sub MOA. Now if a Saiga can do it, I can't see why a VEPR wouldn't. Needless to say, i'd trust the VEPR to be equal to a SCAR at least in accuracy just because technically the SCAR is an AK variant (though they hate to admit that, they changed the furniture enough and hoped no one would notice) and they are both .308s. All that matters in regards to accuracy is the cartridge powder, barrel length, consistency in bullet and barrel diameter and if the barrel is allowed to go through a full motion of oscillations as the shock wave of the bullet races through it. It's like making a fire, you need oxygen, heat and fuel; fail in any of these areas and a fire isn't produced. Likewise, fail to have good powder, accuracy goes down; fail to have enough of a length for the barrel, powder fails to burn, proper force isn't achieved and accuracy goes down; fail to have consistency in bullet or barrel size, a proper seal isn't achieved and well, you see where this is going Basically, any gas piston driven .308 with a 16-22" free-floated barrel will be capable of pretty much the same accuracy and reliability. Logically, it makes sense, but people love saying this one is better than that one because of [insert side option here]. To me the issue isn't a matter of accuracy, it's reliability, weight and cost. This is a technical issue with regards to materials choices. If you choose quality materials, align them efficiently and simply, you'll always achieve success. Quality steel and aluminium beat out most polymers in how reliable and solid they are (though some polymers i've run across are indeed more solid, this seems to be the exception currently not the rule, industry needs to realize that creating solid things that last are preferable, that's another rant..) and wood (while extremely customizable through more traditional crafting and easily replaced with a piece of crap wood that you found on the side of the road and shined up real pretty, aesthetics, another rant..) can be kind of finicky, high maintenance and sadly fragile. Thus said, if you care about weight but want something solid, you're going to have to make a sacrifice somewhere. Me, I'd go for reliability and bite the weight bullet. Turning a problem into a training issue is a great fix for most technical problems, train with a heavy gun and it won't weigh you down (plus, you'll build some awesome muscle); train with something light that breaks under heavy use and you'll run into problems. The Swiss figured this out a very long time ago, if it doesn't work over a long period of time, throw more weight at it and eventually, it'll almost always work and will almost never fail. Everything that is reliable is relatively heavy. Now, do exceptions to this rule exist? I'm sure they do, I just can't think of any examples and would love to hear about them if you have them. That said, if I can save money and still have reliability? Hell Yah! Gotta love steel prices and cheaper and cheaper CNC machining processes. some shotgunnews guys report that AK variants with milled or RPK receivers also heat up and hold the heat, for what that's worth. maybe my M1 (milled, of course) did too and i just never noticed. I would like to see what you do to it, and what you think. Mine is on order, should be here in a week or so.